As we mentioned in the previous article: Brazil Incursion In Finswimming, Thanks To Leblonfins, FEDECAS and Sportsub & Sportalsub a delegation from this great South American country was present for the first time in a FinSwimming Championship, when members of the club Leblonfins / Botafogo participated in the Campeonato Nacional de Velocidad, Interclubes y Universitario de Natación con Aletas FEDECAS 2017 held in Cartagena, Colombia from October 20 to 22. Bruno Frazao , a 29-year-old athlete, won two silver medals in the 50 bifins (22.10) and 100 bifins (50.83) in the Master V0 category (29-34 years) in which he shared the podium with the winner of both tests, the Colombian Julio Cesar Galofre, who has been South American and Central American and Caribbean champion in conventional swimming and represented Colombia in the Olympic Games Beijing 2008. 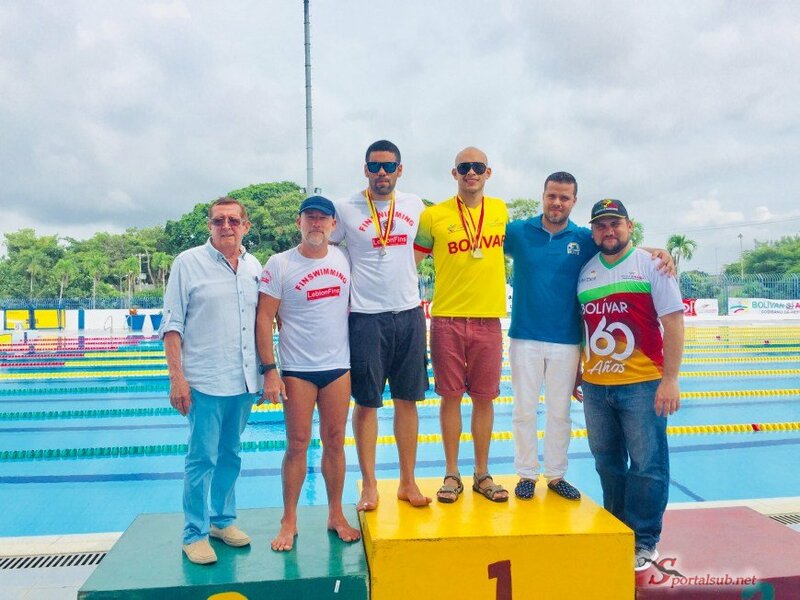 Frazao, becomes the first athlete in Brazil to participate in a finswimming event endorsed by the World Underwater Federation (CMAS), under the organization of the Colombian Federation (FEDECAS), also establishing the first national records in this modality for your country. Brazil’s participation in this important event was made possible thanks to the initiative of Coach Mauricio Jordan (JSC Mauricio) of the Leblonfins Team, who plans to conquer many more international medals for Brazil, as well as the realization of new activities, such as clinics and training in his country and the rest of the continent and the participation of his team and a Brazilian national team in the CMAS 2018 International and World Finswimming Calendar Competitions. Important support also made by the League of Underwater Activities of Bolívar, under the chairmanship of Mr. Moisés Marrugo and the efforts of the event’s Technical Director and Finswimming Coach of the League, Nelson Zapate Uribe, who managed to sponsor the hotel and feeding of the delegation of Brazil during his stay in the city of Cartagena.